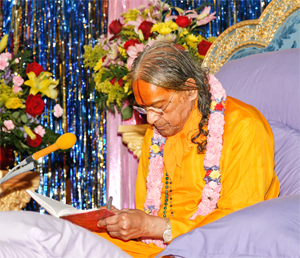 Maharaji Kripalu --Jagadguru Shree Kripaluji Maharaj -- is considered the supreme acharya and Jagadguru of the present age. He accepts the philosophy of achintya-bhedabhed-vad, as well as the philosophy of Jeev Goswami more specifically, that is, the reconciled philosophies of all the acharyas (teachers) who teach the path of selfless bhakti for the realization of Divine love. He has not formed his separate religion. He teaches the path of selfless bhakti to Radha Krishn which itself is the eternal single religion to experience the divine bliss of braj ras and nikunj ras of Golok and Divine Vrindaban. Maharaji Kripalu has not written a separate philosophy. He recognizes that of Jeev Goswami and says that the Bhagwatam is the complete and final scriptural authority and is the explanation of the Brahma Sutra. He says that the desired goal of a soul is to receive the selfless and divine love of Radha Krishn, the soul of your soul. Knowing this you only have to develop a desire for this vision and love by strengthening your faith. Keeping away from bad associations and chanting. That’s all you have to do. You just remember that Radha Krishn are truly yours and you only belong to them. They are most kind and causelessly merciful; they will do the best for you. Shree Maharajji did not relate the divine lineage of this path, like the other acharyas did, because it is directly introduced in the world by Shree Raseshwari Radha Rani and Krishn during Their descension period. It has been also taught by the rasik saints. Shree Maharajji says simply that the ultimate goal of a soul is to receive the selfless Divine love of Radha Krishn and to serve them in Their Divine abode. This is attained through the teaching of a true rasik Saint and the complete purification of the heart through bhakti. Maharaji Kripalu has detailed his entire philosophy of God’s bliss, God-realization and devotion in his writings that are meant to communicate with everyone, from an ordinary literate person to a highly educated scholar. He has revealed an enormous amount of devotional material through his speeches and writings, including teachings, philosophies, covering devotion, God realization and grace, saint’s grace, classes of divine bliss, and the supremacy of the Divine love of Radha Krishn. He also produces guidelines for all kinds of devotees, as well as devotional procedures, leela songs (pad), songs (pad) of humbleness, and the chants of the name, form, virtues, and the leelas of Radha Krishn.